If your garage getting out of hand, you're not alone. Allstate says that a cluttered garage can even be a fire hazard. Although it's often one of the biggest spaces of a house, it's still fairly common to see a vehicle sitting in the driveway because the garage is just too full. That's when you know it's time for a cleanup so here are some garage ideas to get you thinking. Great garage organization lets your car share space comfortably with everything else you'd rather not store in the house. 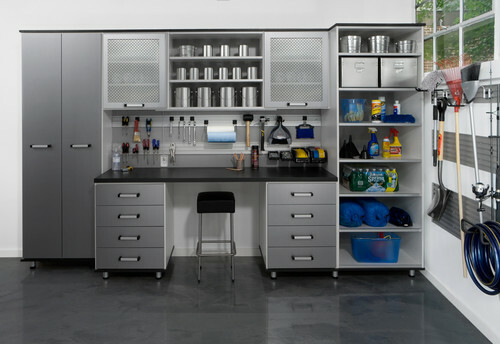 So a garage makeover is one that will give you a clean, organized room without costing a lot. 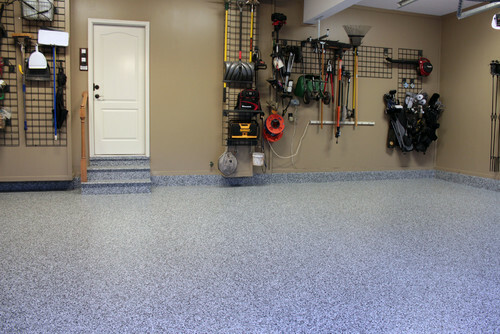 There are many garage floor paints available to refinish the floor. Epoxy paints are made for this job, and they come in a variety of colors. There's even a speckled additive to add a stone-like look, and of course, it helps hiding most dirt. If you've got tall ceilings in the garage, that's another opportunity for adding storage space. While you won't want to put up things that are really heavy, it's the perfect place for holiday decorations and camping equipment. For the handy person or mechanic (or both) in your home, a work bench and tool storage make a lot of sense. Much more than occasionally setting up sawhorses and plywood for each project, a well organized workbench makes these projects more fun … which helps keep the to do list under control. You can buy a prefabricated workbench at home improvement centers, and they look great but not fit your unique needs. If you want to design your own workbench, consider using kitchen cabinets (uppers, base and pantry cabinets), old fashion pegboard and a laminate counter top. Sports-minded families might have bikes leaning against the wall, baseball bats upright in a corner, basketballs in a storage tub and other equipment anywhere there's a flat spot to set it down. When you get organized, you'll find it easier to access everything, and you won't have to worry about driving over a stray softball or skateboard. Pre-made rack systems are ideal for storing sports equipment. There are bicycle racks that mount on the wall or ceiling, and special hooks made for keeping bats and racquets off the floor. Bins and chests hold smaller equipment, and everything should fit nicely along any wall in your garage. Maybe you don't have a lot to store in the garage and you're thinking about converting the garage to a bedroom. Realty Times says claiming garage space for a bedroom or den isn't always the best idea. There are hidden costs like ductwork for heating /cooling, insulation and drainage as most garages are built on a slab which is more susceptible to water. Have you given your garage a spring cleanup yet? We hope these garage ideas are enough to get started and you'll be proud if your neighbors occasionally peek inside.